So even though I didn't get quite as much Valentine's fun out as I hoped I would, I decided I'd share a little bit of it with you today. 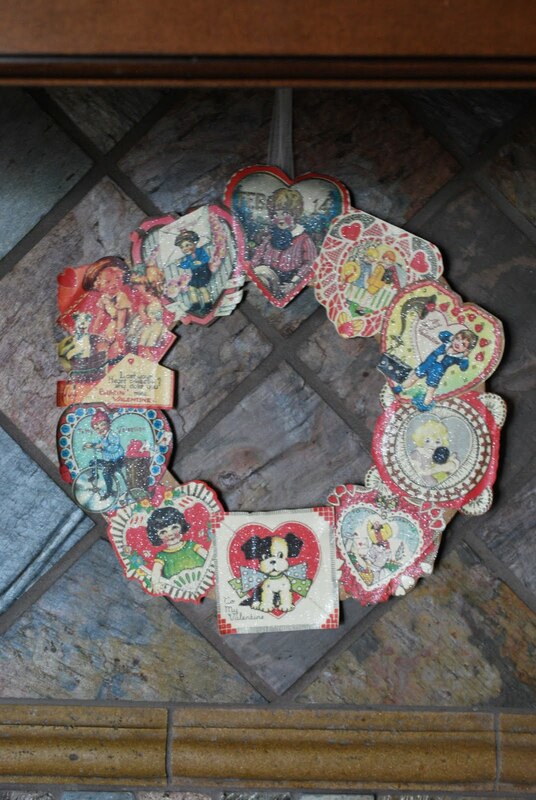 First up, my cute Vintage Valentine wreath. I was inspired to make this after seeing one on the Williams Sonoma website. If you'd like to learn more, I talk about how I created this little darlin' here. Next, my Valentine tree. I used the same spray-painted-white branches that I had as my dining table centerpiece for Christmas. 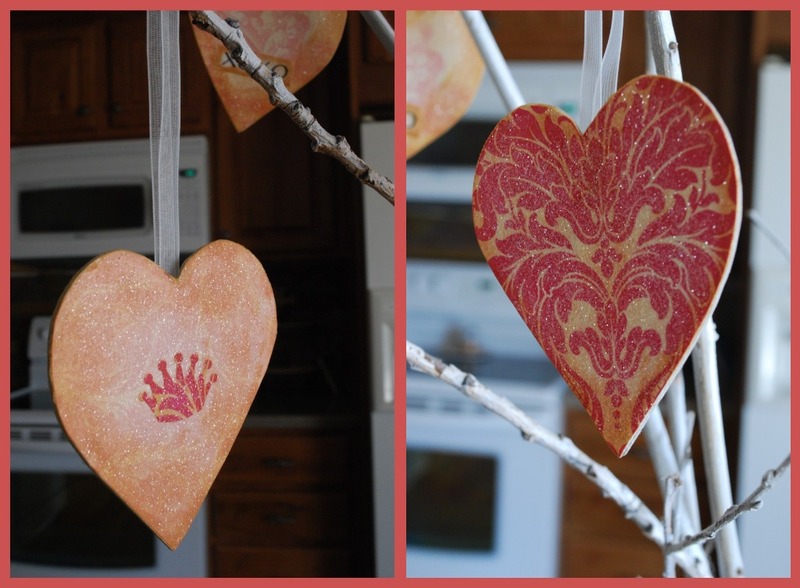 I just switched out the birds and book page ornaments for these pretty glittered chipboard hearts. I heart them. Yes, the pun was intended. 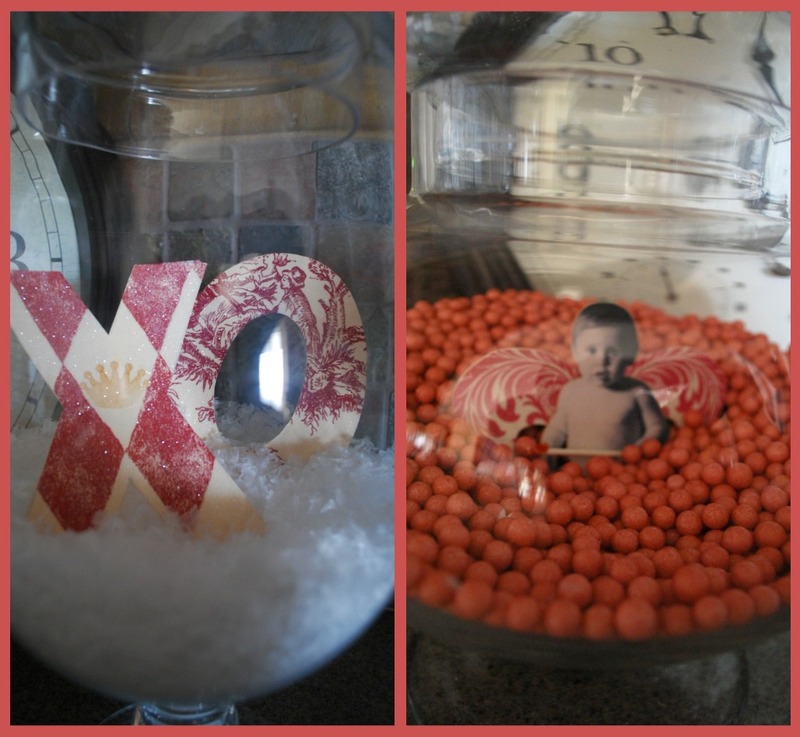 I filled one of my apothecary jars with some funny pink vase filler and a sweet little cupid pixie I made from a baby photo of the Princess. You can read about how to make my famous pixies here. The other apothecary jar contains a sweet pair of glittered chipboard X and O letters. And just so you know, I've determined that it is absolutely impossible to get a decent photo of this corner in my kitchen....so I'm apologizing for these less-than-stellar images. Last year, we started a tradition in our little family of writing love notes to one another during the month of February...then reading them on Valentine's Day. I made this sweet little Valentine pouch for us to stuff the notes in. You can read more about it here. Finally, I'm afraid this is as far as I've gotten with my mantle decor so far. One little heart (although it's a pretty little heart.) But I'll tell you a little secret as to why I haven't done more. I finally got so sick of the ugly fireplace stone, that I was brave enough to approach our landlords about painting it... and they said "yes"! Can I hear a "woot woot!"? So the hubby and I will be tackling that project this week. I'll post about it, of course! And then I'll finish blinging up the mantle with some Valentines-y goodness! Even though I didn't get much up on my mantle (for very good reason! )...I'm linking to Beth's Valentine's Mantle party...hop over and enjoy all the Valentine's goodness. I have that same mirror! Is yours from Tai Pan too? I love the vintage Valentine wreath and all the other creations! I need to get going with some Valentine craft projects! 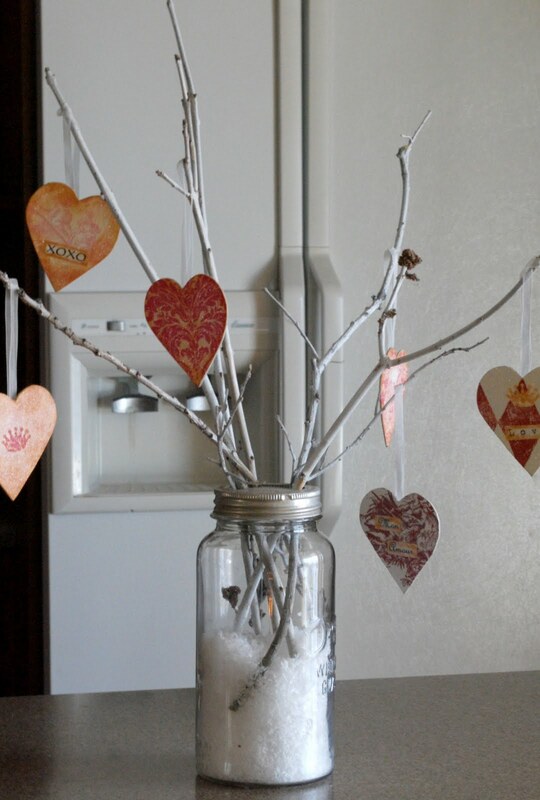 Love the hearts hanging from the branches, I have an arrangement very similar to that (white branches in vase) that would love a few hearts hanging from it! 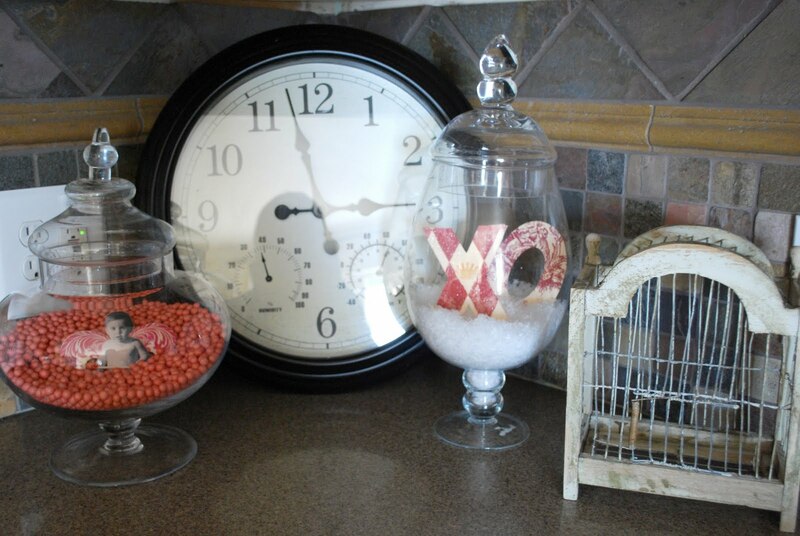 I love how you filled the jars, and the vintage images are great! i love that wreath and what you've done with your apothocary jars. I have two new BIG ones and have been wondering how to fill them up! love the valentine notes/pouch...what a great idea! the jars are so cute too, love it all! love the baby in the candy, so cute! That wreath is awesome. Thanks for sharing the link and your cute project! You put me to shame with my few little decorations for Valentines Day!!! Everything looks beautiful! Really like the vintage card wreath!